In four rows of two, Miss Lina's eight ballerinas dance to the park, at the zoo, and even while doing their schoolwork. But when Miss Lina introduces Regina, a new girl, the group of nine's steps become a mess. Full color. GRACE MACCARONE is a children’s book editor and the author of many books for young readers, including the First Grade Friends series illustrated by Betsy Lewin. She lives in Westchester, New York. CHRISTINE DAVENIER has illustrated many books for children, including the Piper Reed series, and was the recipient of a New York Times-Best Illustrated Book Award in 2002 for The First Thing My Mama Told Me. She lives in Paris, France.
" An infectiously rhyming text not a little reminiscent of "Madeline. "Author and illustrator have teamed up for a lovely story about friendship, ballet and grouping numbers. Davenier's colorful illustrations are filled with humor, movement and lovely shades of pink young readers, budding ballerinas or not, will enjoy the details of the ballet studio and the "joie de vivre" of the nine young ladies. "Kirkus Reviews"
The book is a charmer. "Publishers Weekly"
The children are full of movement and expression, and the setting has a Parisian feel. Reminiscent of Ludwig Bemelmans's Madeline, this will be a crowd pleaser with aspiring ballerinas and also makes a great introduction to a math lesson on number groupings. "School Library Journal"
French illustrator Davenier (one of "the New York Times"' Ten Best illustrators for 2002) keeps the little girls exuberantly dancing in class, through math lessons, in the park, at the zoo, and at the beach. Her ink, watercolor and colored pencil drawings are lively, detailed, and witty; readers may enjoy tracking the shades of pink from pale to potent in fashions for nightgowns, bathing suits, school dresses, and shopping outfits--as well as tutus. (They can also note that the new classmate wears hot pink leg warmers, as do all the others when they finally accept her.) Maccarone's agile rhyming text dances along, too, making good use of the nine musical names Christina, Edwina, Sabrina, Justina, Katrina, Bettina, Marina, Nina, and new friend, Regina. Girls who love dance will likely find this story of immersion in ballet, making friends, and learning to adapt, most appealing. "Children's Literature"" Praise for "Miss Lina's Ballerinas: "
"An infectiously rhyming text not a little reminiscent of "Madeline...."Author and illustrator have teamed up for a lovely story about friendship, ballet and grouping numbers. Davenier's colorful illustrations are filled with humor, movement and lovely shades of pink...young readers, budding ballerinas or not, will enjoy the details of the ballet studio and the "joie de vivre" of the nine young ladies." --"Kirkus Reviews"
"""The book is a charmer." --"Publishers Weekly "
"""The children are full of movement and expression, and the setting has a Parisian feel. 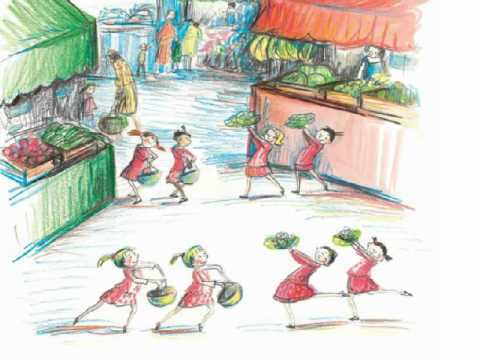 Reminiscent of Ludwig Bemelmans's Madeline, this will be a crowd pleaser with aspiring ballerinas and also makes a great introduction to a math lesson on number groupings." --"School Library Journal"
"French illustrator Davenier (one of "the New York Times"' Ten Best illustrators for 2002) keeps the little girls exuberantly dancing in class, through math lessons, in the park, at the zoo, and at the beach. Her ink, watercolor and colored pencil drawings are lively, detailed, and witty; readers may enjoy tracking the shades of pink from pale to potent in fashions for nightgowns, bathing suits, school dresses, and shopping outfits--as well as tutus. (They can also note that the new classmate wears hot pink leg warmers, as do all the others when they finally accept her.) Maccarone's agile rhyming text dances along, too, making good use of the nine musical names Christina, Edwina, Sabrina, Justina, Katrina, Bettina, Marina, Nina, and new friend, Regina. Girls who love dance will likely find this story of immersion in ballet, making friends, and learning to adapt, most appealing." --"Children's Literature""" Praise for "Miss Lina's Ballerinas"
..".the book is a charmer." --"Publishers Weekly "
"French illustrator Davenier (one of "the New York Times"' Ten Best illustrators for 2002) keeps the little girls exuberantly dancing in class, through math lessons, in the park, at the zoo, and at the beach. Her ink, watercolor and colored pencil drawings are lively, detailed, and witty; readers may enjoy tracking the shades of pink from pale to potent in fashions for nightgowns, bathing suits, school dresses, and shopping outfits--as well as tutus. (They can also note that the new classmate wears hot pink leg warmers, as do all the others when they finally accept her.) Maccarone's agile rhyming text dances along, too, making good use of the nine musical names Christina, Edwina, Sabrina, Justina, Katrina, Bettina, Marina, Nina, and new friend, Regina. Girls who love dance will likely find this story of immersion in ballet, making friends, and learning to adapt, most appealing. " --"Children's Literature"""